The time was right. I had nothing to attach me to Mexico City as I did to Queretaro. My University, my job, my friends are as close as I turn my laptop on. If most of my friends and family are in El Salvador, it does not matter if I talk to them from Mexico City or Queretaro. But I have a lot of things to win at Queretaro. Been close to my boyfriend would help us to grow our relationship even more, been close to my boyfriend would help us to know each other deeper and certainly been close would make us happier. That is why I decided to move to Queretaro. Honestly, I thought I would be living close to him, not with him, but things got greater and he found a perfect house for us to rent. Yes, we live together now, him, her cousin, my kitten and I. We visited the house before actually move in, so, we had like a week to decide wich room will be for each. First days at the new house were a chaos of boxes. We just throw everything from everyone on the livingroom and see what happens for the next few hours. Even though we try to decide wich one was gonna be our each room, at the end of the day we choose by the first who take it. I guess it was the perfect way to do it because everyone took the best room for their self. David took the bigger room. He has the bigger bed and he has a lot of stuff (closet, tables, TV, Xbox, stereo). Poli took the quieter room. She likes to read a lot and when we watch movies we better not have any interruptions. Also, she has the best WiFi signal area. I took the brighter room. I study and I write a lot. Also I am quite chilly so I needed the room to have direct contact with the sun (and I have a great panoramic view, too). Like David & I were gonna sleep at the same room, we decided to turn my room into our working space. Homework, works, projects and stuff in my room and relax&chill in his. Write for a living is great, I mean it, it’s one of the best things that could happen to me. I am really thankful to Internet for it, it gave me time I need for my projects and family. But, as every transaction, for you to spend something, you need to invest something first. I have to invest time on Internet to spend time with my family. There is no other way. So I needed to have my studio in adequate conditions to invest time on Internet (University and job). I always thought those adequate conditions were only the room features, as in white walls, big window, fresh air and bright sun. I was wrong, the exterior makes you think about it twice. Noise pollution can irritate you faster than what you think. People asking you random stuff can distract you more than what you think. Strangers calling you on the cellphone or ringing your house’s bell can remove time more than what you think. That is why I started writing at nights but my body says otherwise. The bad thing about write at nights it’s you need to get some sleep at the sun hours. Meaning, when the sun comes out, you might be getting in bed. So you need something to protect your sleep at least on the finals week. Well, my window is the biggest window I have ever seen. From the half of the wall to the top it is a window. One of the things that I need to protect my sleep it is a really good curtain. And the ones I had are not. I saved some money and I bought a sewing machine. I knew if I wanted good curtains to protect my sleep, I should do them. Or at least, pick the color. I didn’t know where to start. I have never used a sewing machine but I got one, LOL! I used the sewing machine to fix some of my jeans, anyway. Then, finally my visa was updated so the first thing I had in mind was visiting my family and my country after 20 months abroad. I deserved that trip, I need a vacation and what a better vacation than relax with my family! The synonym of relax, sometimes and in most of the houses of Latin America, it’s watching TV. When we watch TV we do not feel the need to think. You are only receiving information while laying on your bed or sofa. We are free to fall asleep while watching it because in holidays there is only one thing you should do: RELAX. A few months ago, I did not have television and obviously did not watch it. But my mother-in-law visited us at our Queretaro’s house and spend her vacations with us. This is important, because I cross that line to hate television to love relaxing with it. She bought a TV for watching the Olympic Games with us. We enjoy that time and then we found more exciting channels, like History Channel, Warner Bros, Sony & – my favorite – H&H. So, when I landed El Salvador I knew what channel I’ll use to relax, of course I’ll be zapping from WB to H&H. Although I love watching TV series on WB, I actually find fascinating the H&H advertising. The H&H advertising makes you stick with it, with the channel, and stay there all day long, because they advertise their content. Meaning, most of their TV commercials are about the next TV shows they will send. So, if a good TV show caught my attention, their advertising made me stick with them. Besides I learn a few things. One of the few things I learn was knowing where to start. 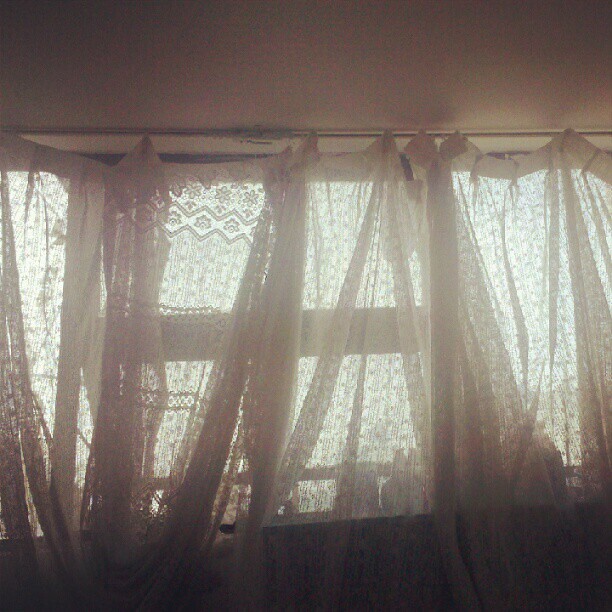 If I wanted to conquer that room as my personal space for creativity, I had to start with the curtains. I never knew I’d be so close, but I was. I just kept watching until a clear idea of what I wanted to do with that room and how I wanted to look that room came up. Suddenly I had the color, the shapes and the way I will clean it. It was amazing, I never knew TV could do that. My mother gave me the curtains, the only thing I did was giving the measures and pick the color – wich it was not difficult because my favorite color is aqua. I travel back to Queretaro with my curtains and with an idea. Idea, wich, I have begun to start yesterday. The main idea is conquer that space and make it mine for the purposes I want it to be. What differentiates me from the Katherine 2 back in March it’s that I know what to do, now. Yesterday, with the hurry of having lots of duties and not having the space for my own, I put the curtains, oh, yes I did. I knew that the precise moment I put the curtains, there was no turning back. Right now, I am cleaning out this bedroom. I am not only doing it but also traveling 2 years through stuff I accumulated. I am watching every little thing I have and try to feel its meaning, the meaning I gave to it. I want to know if its lifetime continues with me or if it’s time to say goodbye. I want to clean all that, I want the things I keep for me help me to fix problems forever, I want them to be useful. I started conquering my bedroom yesterday, we will see who wins, my baggage or me. Previous Post El maquillaje no está hecho para esconder imperfecciones sino para demostrar emociones. Next Post Google sí escucha y corrige sus errores: correos electrónicos de Google Plus.